Often it is difficult to determine if an intra-abdominal injury has occurred in a blunt trauma victim. In many cases, the decision about when to perform an exploratory laparotomy surgery is not straightforward. One procedure used to determine whether blunt trauma victims require surgery is diagnostic peritoneal lavage (DPL). DPL helps determine whether an intra-abdominal injury exists and whether sugery is required. 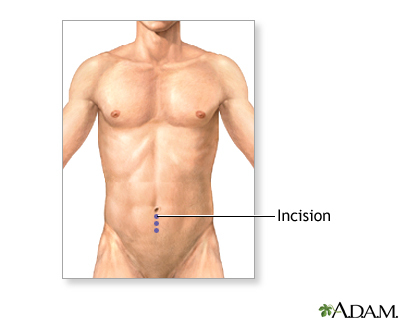 Using local anesthesia, the surgeon makes a small incision in the abdomen just below the umbilicus.